Whenever Zhu Ran causes damage, he can choose to immediately draw one card and end the current turn. All other effects are ignored when this ability is activated. Zhu Ran can activate "Nerves Of Steel" both during and outside of his turn. If he can manage to cause damage during another character's turn, he draws one and they end their turn. If Zhu Ran causes damage during an action phase and activates "Nerves Of Steel," the player taking their turn immediately ends their action phase, skips their discard phase, and the next player takes their turn. This works even if it is another player's turn. Zhu Ran can activate "Nerves Of Steel" to prematurely prevent other characters from taking damage. For example, if he plays Barbarians during his turn and the character to his immediate right is damaged, he can activate this ability and prevent the tool card from targeting other characters. When Zhu Ran activates "Nerves Of Steel" when damaging a character with a damage-activated ability, the target cannot activate their ability, as Zhu Ran immediately draws one card and ends the turn. Characters that are brought to the brink of death or killed present exceptions to the aforementioned rules about "Nerves Of Steel." The brink of death must be resolved before "Nerves Of Steel" can be activated. Also, effects that take place upon the death of a certain character are not skipped either. 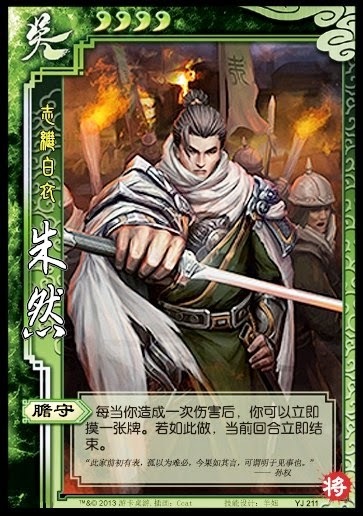 For example, if Zhu Ran kills Ma Su, "Bottomless Tears" is activated, causing Zhu Ran to discard all of his cards. A similar rule applies when Zhu Ran kills a rebel - he draws three cards regardless of whether or not he chooses to activate this ability. After effects like these are carried out, Zhu Ran can choose to activate "Nerves Of Steel," draw a card, and end the current turn. Zhu Ran is a very unique and well-designed character. "Nerves Of Steel" is excellent against character's with damage-activated abilities, as they cannot activate their abilities when Zhu Ran activates its. It is also excellent when using Barbarians or Hail of Arrows as Zhu Ran can activate the ability when he hurts an enemy and prevent the card from affecting his teammates. Zhu Ran seems to be best as a loyalist or spy. When he kills a rebel and activates "Nerves Of Steel," he draws four (!) cards and skips his discard phase. With the additional cards, it becomes easier for him to damage other characters in subsequent turns and continue to activate "Nerves Of Steel." Zhu Ran is not as good as a rebel unless the king has a damage-activated ability.